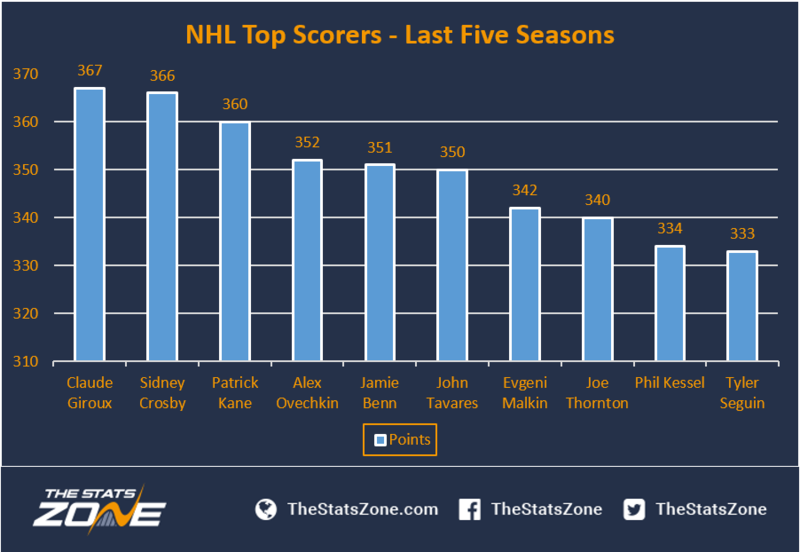 Who Leads The NHL Scoring Charts In Recent Times? With the 2016-17 NHL season now underway, we thought we’d delve into the stats to see who the top performers have been over the past five seasons. Surprisingly, the top scorer over the last five years is not a player you would expect. Despite the fact that Alex Ovechkin, Patrick Kane and Sidney Crosby have been elite players in recent seasons, the one with the most points is Claude Giroux. The Philadelphia Flyers center’s consistency over the years has been nothing short of admirable. Judging by the table, the Pittsburgh Penguins seem to have the best attacking core in the league as Crosby, Evgeni Malkin and Phil Kessel are all in the list. The Dallas Stars also have two players as both Jamie Benn and Tyler Seguin cracked the Top 10. Again, Giroux tops the center position with Crosby breathing down his neck. The third place, however, surprisingly finds John Tavares. The New York Islanders’ captain definitively doesn’t have all the recognition he deserves, and he’s proven to be a consistent asset since he averages over one point per game (350 in 349 games). Evgeni Malkin from the Pittsburgh Penguins and Joe Thornton from the San Jose Sharks round out the top five. Nothing surprising about this, as both have been among the league leaders in scoring for years now. One can only wonder how much better would Malkin’s numbers be if he were the focal point of the offense in another team, considering he has to split the load with Crosby in Pittsburgh. Unsurprisingly, Kane has been the league’s best right winger over the last five years with 360 points in only 341 games. He’s coming off a record-setting season when he finished with 106 points in 2015-16. The drop off after Kane is quite considerable. Between the first and the second spot (Kessel) there are 26 points. Between the second and third (Wheeler), we have 21 points of difference. And between the third and fourth (Perry) we have 18 points. Surely no one is surprised with the name of Alex Ovechkin at the top. The Russian Rocket has been one of the league’s best scorers in the past few years, and he could easily finish his career with 600+ goals if he can maintain this pace. Coming in second is Jamie Benn. The Dallas Stars forward won the Art Ross Trophy after leading the league in 2014-15, and came up in second place just behind Patrick Kane in 2015-16. Max Pacioretty is certainly an entry some fans may not expect to see this high. While no one can deny how talented he is, the fact that he’s above players like Henrik Zetterberg, Patrick Marleau and Patrick Sharp is worth noting. Just like it happened with the right wingers, the drop off between the top two and the rest is pretty steep. Benn ranks second with 351 points, and Pacioretty ranks third with 295 points. The best scoring defender – and with a huge advantage of 74 points – is Erik Karlsson. The Swedish playmaker from the Ottawa Senators is certainly an impactful player on both sides of the ice. The top goal scorer in terms of goals per game ration however, is Shea Weber, with 86 in 361 games.